Early break for Ipswich as Murphy sets Sears away down left. His cross cleared by Williamson. Skuse tries first time shot. Well over. We're underway. 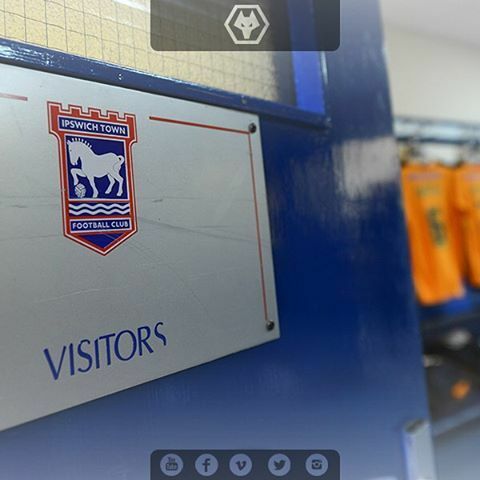 Wolves in their traditional gold and black will play from right to left as we look at the pitch. A minute's silence in memory of Marton Fulop and those who lost their lives in the Paris attacks is immaculately observed at Portman Road. Come on lads, show us what you are made of. Hi to everyone out there today, be nice to beat Ipswich today so COME ON GUYS SHOW MICK WHAT HE IS MISSING. Buenas Tardes to all from an autumnal Spain today. 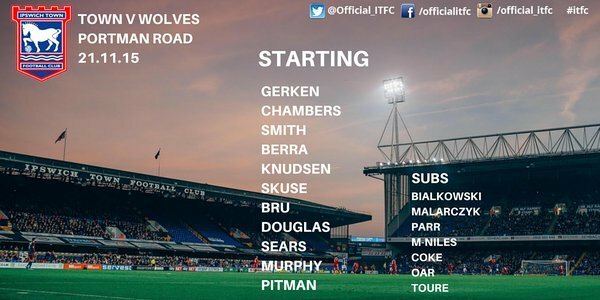 Lets hope for a good performance from the team COYW! 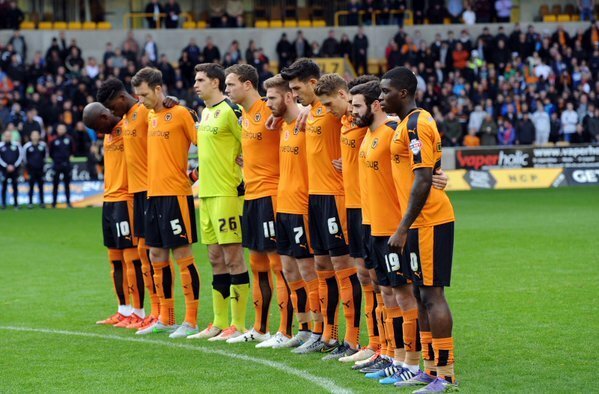 Will now be a minute's silence in memory of former Ipswich keeper Dean Gerken and all of the people affected by the terrorist atrocities in Paris last Friday. Afraid the hands are very cold here. Apologies in advance for any lack of pace or spelling mistakes! Hello everyone - let's hope we can start to get a good run of results in November / December. Grant Holt's name getting booed. He'll love that. Wolves players completing their warm ups in those swanky white jackets. It's that cold. Players just walking out on a bitterly cold afternoon here at Portman Road. Afternoon all. have to agree with Canada and go for 2-0 today, please! Good luck to the boys today. 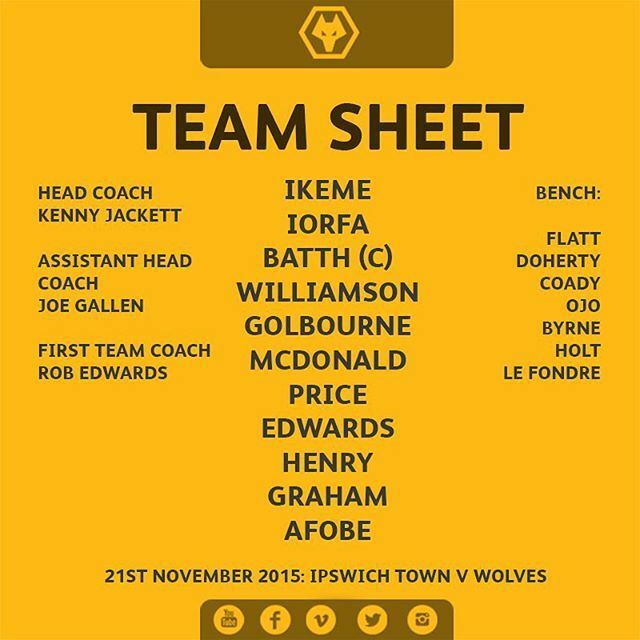 Jordan Graham the 7th player to play in Sako's position this season. Good luck to him. morning from Canada _1 and snow here WOLVES 2-=0 . Good luck to Jordan Graham today! Would have been nice to have seen Byrne on the other side. 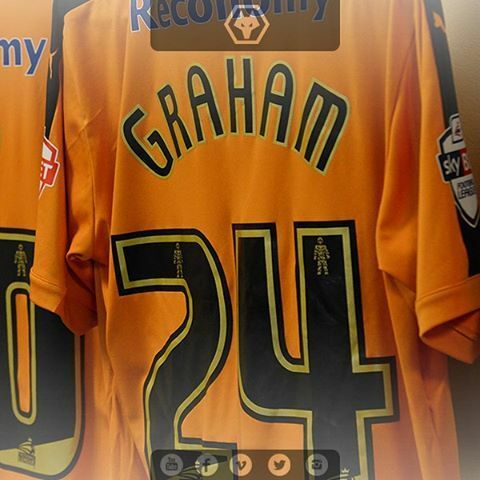 Yes, good luck to Graham and the rest of the boys today. Good afternoon all. Afternoon all. Apologies for the delay. Few technical issues but hopefully they are gone for now. Belatedly bring you the teams imminently! Don't forget to log on to Player HD to hear full match commentary of this afternoon's game with @BurrowsMikey and Andy Thompson. Congrats to massive #wwfc fans @fordy29 and Miller J, who had their first boxing fights last night, raising £1k for Cancer Research. Good luck also to the Under-18s facing an equally long trip in another direction - at Newcastle away. Four unbeaten for Jerry Gill's team.